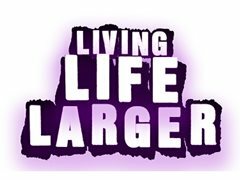 Living Life Larger is a new twice monthly audience interactive Web TV show all about the topic of well-being. It's designed for the people by the people. And we want you to get involved! We are looking for audience members interested in the subject of well-being to help make the show happen. The main role of the audience is to engage with the presenters and participate in various show segments. Such as testing, reviewing and discussing their experience of various well-being products on the market: books, audio tapes, workshops, diets. Selected audience members will be expected to devote their own time in between shows to fulfilling these obligations, coherently and knowledgeably discussing their findings on air. The ability to talk concisely and coherently on live TV is a must. No previous professional experience is necessary, just a genuine drive to be fun, fantastic and deliver a great result on air. And no egos will be tolerated, this is a huge team player exercise. The show films twice a month so all volunteers will need to be available for these time slots. They will also need to be available for show development and research briefings in between shows. If your initial application is successful, we will then ask you to send a short video of your presenting skills to us telling us about yourself, why you want to get involved, and what you can bring to the show. We are looking for audience members interested in the subject of well-being. The main role of the audience is to engage with the presenters and participate in various show segments. Such as testing, reviewing and discussing their experience of various well-being products on the market: books, audio tapes, workshops, diets. Selected audience members will be expected to devote their own time in between shows to fulfilling these obligations. The ability to talk coherently on live TV is a must.